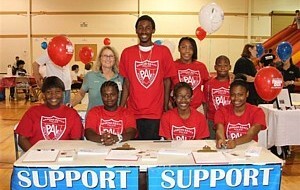 (Jacksonville, Fl), (July 2010) - Florida PAL is pleased to announce it has received funding to establish a youth mentoring program and drop-out prevention program. With funding from the U.S. Department of Justice's Office of Juvenile Justice & Delinquency Prevention, the National Association of Police Athletic/Activities Leagues, Inc (National PAL) is providing program awards to 135 PAL Chapters. Florida PAL is pleased to have been selected as one of the 135 grant recipients for this exciting program. PAL staff participated in a two-day national training for the development and implementation of the PAL's new youth mentoring and drop-out prevention program in July. The Mentoring Program involves recruiting volunteer Mentors who will be matched with a youth Mentee. Volunteer Mentors agree to meet with their Mentee at the Chapter for at least one hour per week for ten months. Besides offering friendship and a listening ear, Mentors and Mentees will engage in a variety of fun and meaningful activities individually and in groups. With the support of the award funds, the Chapter has hired a Mentor Program Coordinator who will oversee the initiative. It has been demonstrated that a trusting relationship with a caring adult can have a life-changing effect on a young person. Research data indicates that mentoring programs have reduced first-time drug use by almost 50% and first-time alcohol use by 33%. In addition, mentored youth displayed greater confidence in their schoolwork and improved their academic performance. If you are interested in sharing your time and your knowledge and making a difference in the life of a child, please contact (Bernard HArtzog, Mentor Program Coordinator) at (904) 642-1412 or stop by to learn how you can become a volunteer Mentor.